What a Beach Crowd?!? 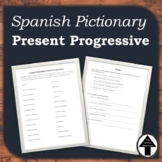 Use this free resource to reinforce teaching of the Present Progressive tense in Spanish. Students will practice their writing by describing the crazy beach scene included on the worksheet! Great for High School Spanish 2 students. Enjoy this resource from @SraBenfieldSDHS! 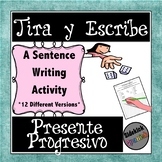 This is a fantastic way of having students practice the present progressive tense in Spanish. There are 48 easy to print clue cards. Students enjoy the game and have fun learning. Directions included. Set of 3 worksheets. Page 1 uses the present progressive of 12 AR verbs. Page 2 has 12 ER and IR verbs. Both of these worksheets have a picture to indicate which verb to use. Page 3 has verbs with the present participle ending in YENDO; 4 general sentences and 7 with leer. Worksheet has 25 fill in the blank sentences. Students are to conjugate the given verb in the present progressive. Includes regular and spelling change verbs. 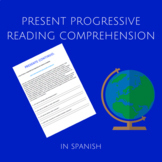 present progressive in spanish / presente continuo. 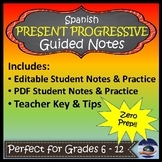 Guía presente progresivo / present progressive in spanish. This presentation contains a quick explaination of the progressive with several slides of guessing based upon clues in Spanish. Also reviews Ser/Estar and adjectives. Get your students writing sentences in a fun, engaging way! Use the present progressive describe what people are doing right now. Includes -ar, -er, -ir, and irregular verbs (yendo).Students roll 2 dice (or one two times) and use the numbers to determine what they must include in their sentences. 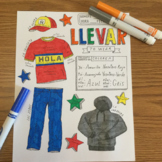 A short and easy to follow graphic organizer on the present progressive tense in Spanish. Students can take notes, practice the tense, and do an oral practice with partners. A quiz is also included. Answer key is included for both the organizer and the quiz. 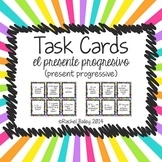 *this can be used as a test, quiz, entrance or exit ticket to assess student understanding of estar used with present progressive in Spanish in combination with chores, daily responsibilities and house words. 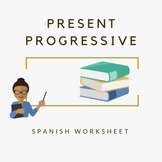 This powerpoint will take students through what the Present Progressive form is and how to create it in Spanish. Verbs included are regular ar, er, and ir, along with irregular and stem changers. Includes practice with reflexive verbs also. Print on cardstock and cut into cards. Includes 14 verbs. Use to play Spoons; students collect the full conjugation of 1 verb. Use to play Uno, students play cards on the discard pile by matching either the verb or the subject.